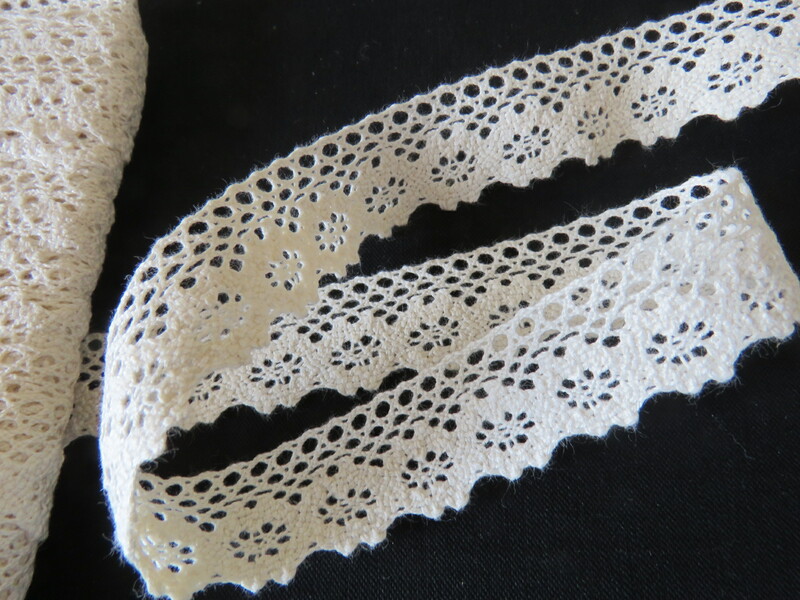 Vintage Lace Trim French Edging Scallop Edge 3 yards x 7/8"
This is a vintage French cotton lace trim edging which features: a netted design at the top of the lace detailed flower like pattern towards the bottom of the lace. The lace is nicely finished off with a scallop edging. Measurement: 3 yards x 7/8". Color: dark cream (See photos). Material: Cotton. The lace is a medium weight and soft to the touch. The trim has never been used and ready for your imagination! Condition: The vintage trim is in very good unused condition and looks clean. The lace at the bottom edge has curled a little as it was wound around the cardboard and may need to be pressed with an iron. The vintage trim is in "as found condition" in that I have not washed it. The photo of the cardboard is just to show original state and information. There is no cardboard included with lace purchase. There are no markings on the cardboard to indicate the fiber content however I do believe that it is cotton. This lace was purchased from the United Kingdom and I was told that it was French in origin.